An urgent process is one of four levels of service that Writ Legal offers in regards to service of process. An urgent process is the fastest level of service that Writ Legal offers. Service is attempted same day or less than 24 hours. 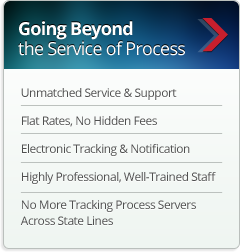 Other levels of service include Standard Process, Express Process, Priority Process, and Urgent Process.